we encourage you to read all of our rules and regulations before you come. 1- Trail riding is only for registered campers and not open to the public. Your toys MUST be insured. 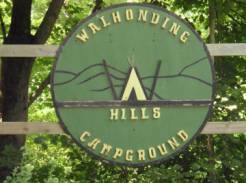 Riding of ATVs, UTVs and other off rode vehicles is only permitted on campground property. DO NOT TRESSPASS on surrounding properties. 2- The second weekend in October is the last weekend for riding and weekend camping. 3- We do not accept checks or credit cards. There is no ATM on site, or nearby. So please come prepared. · More than likely your GPS will be wrong. You do not want to take TR 366 or Bat Nest off of SR 715, these are unpaved and rough roads. Stay on SR 715 until you get to CR 368. This will take you on a paved road to TR 364, which is where we are located. You will see blue signs with a camper on them. · If you want to bring your ATV, golf cart, rail buggy, dirt bike, or any other motorized toy, you MUST bring proof of liability insurance for every toy. This is for your safety and the safety of your fellow campers.